Would you like to earn more money? Are you interested in attracting financial security? Are you burdened from the daily stresses that restrict you from seeing life changing opportunities? Would you like to re-programme your mind to achieve the state required for monetary wealth? If you want to achieve permanent changes, you need to communicate with your subconscious by speaking the "language" it understands. Within this hypnosis recording, Benjamin Bonetti will offer your subconscious mind the tools required to rewrite the script that directs your thoughts and behaviours. He will guide you into a deeply relaxed state where you will start to visualise effortlessly the life you desire - a life based on good health, self-fulfilment, self-empowerment, monetary abundance and happiness. 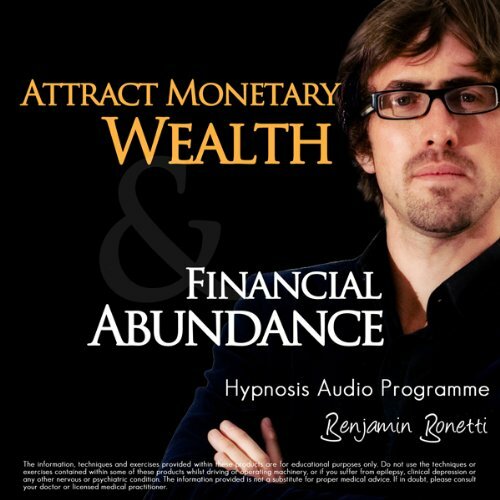 In Attract Monetary Wealth & Financial Abundance, Benjamin Bonetti, highly respected celebrity coach and hypnotherapist introduces you to the remarkable power of hypnosis to create specific and positive permanent changes applicable to every aspect of your life. Unfortunately no one in audible ever thought of installing a repeat feature so the hypnosis can play whole night while asleep. The narrator has a soothing quality to his voice, and overall I'm waking afterwards feeling refreashed and ready for the day. Funnily enough after 3/4 listening a my finances have improved a little. Excellent voice and style for hypnosis. Managed to relax completely and I feel extremely positive - as though blocks have been shifted after only one session!